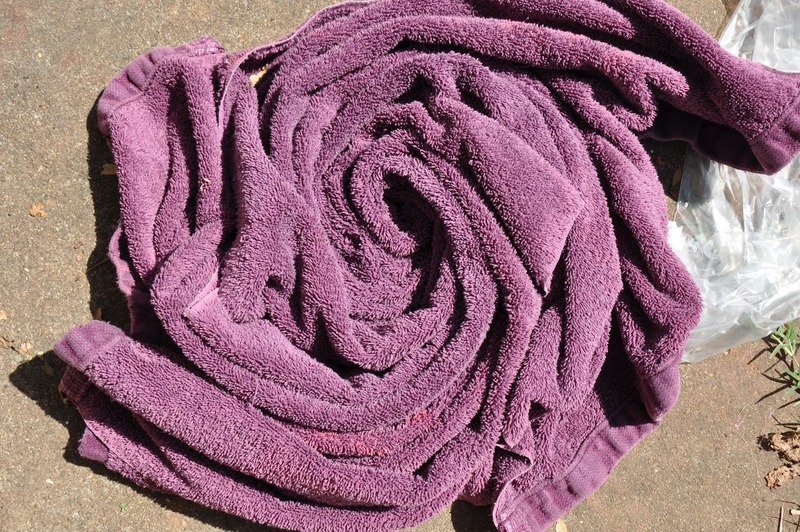 What to do with old towels with the bleached out areas? 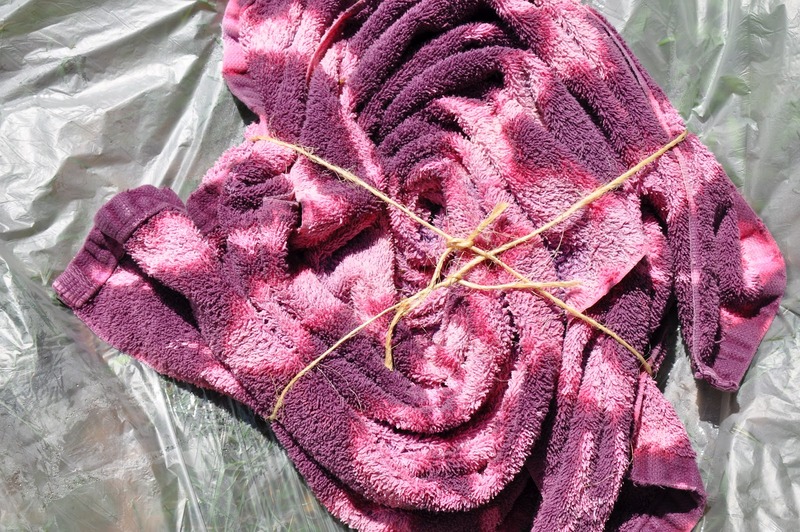 Instead of tie dying, try bleach dying. I normally am not a huge fan of the nasty chemical of bleach, so I do not do this technique very often. However, when done correctly, it has really neat results. 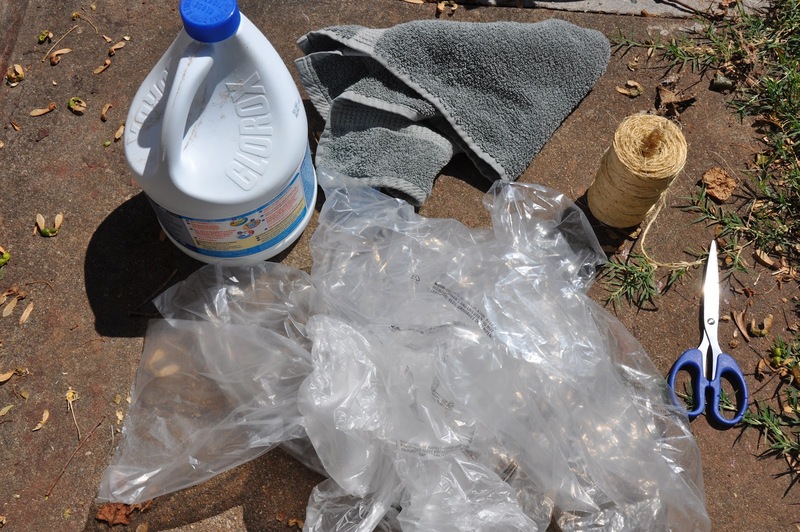 Supplies needed: bleach, old towel, twine, plastic bags, plastic tarp, scissors, and gloves. A bowl of water is also helpful. Soaking the towels you are going to bleach dye helps create a more interesting design. 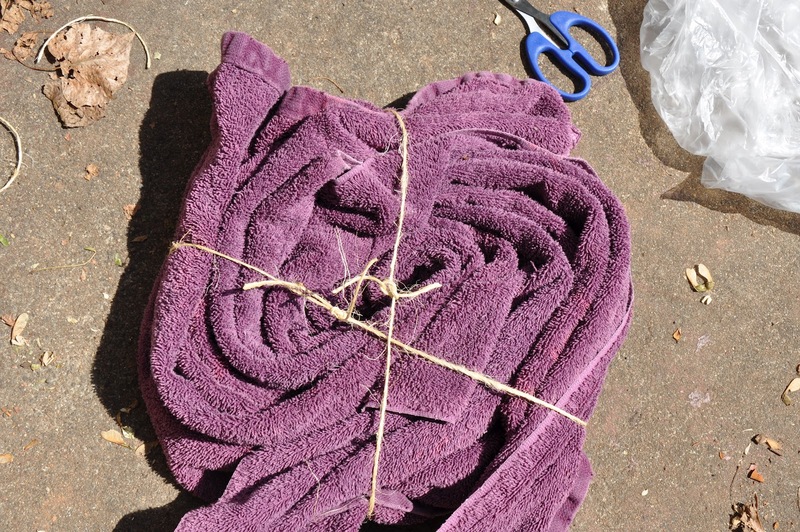 For this design, I rolled the towel and then tied it in four locations with the twine. 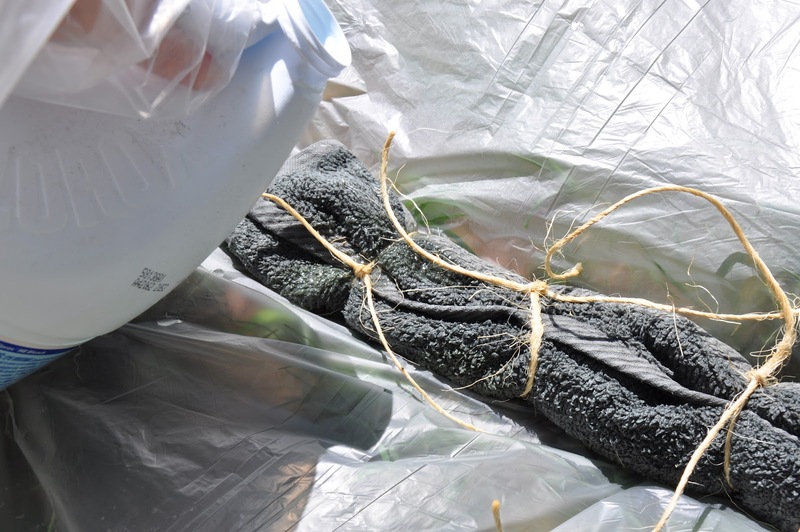 Place the towel on the plastic work area and then pour the bleach, concentrating on the areas tied with twine. 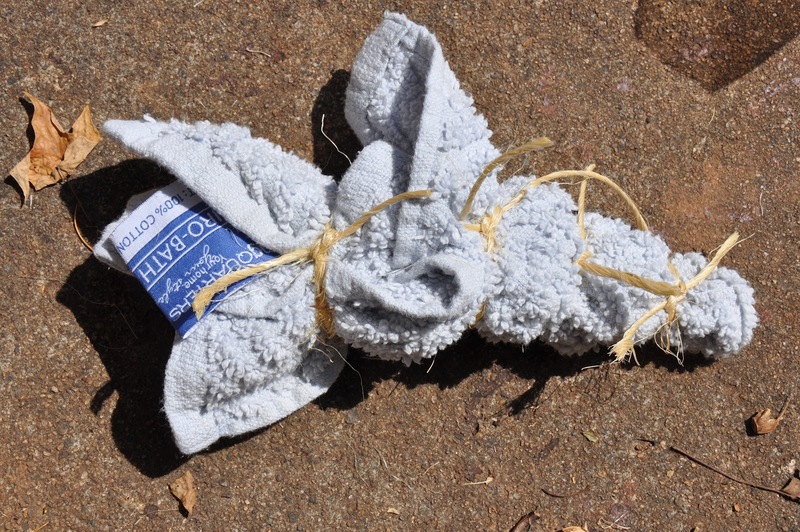 Bag the towel, tie it closed, and let it rest in the sun. Not even five minutes later, it looks like this. 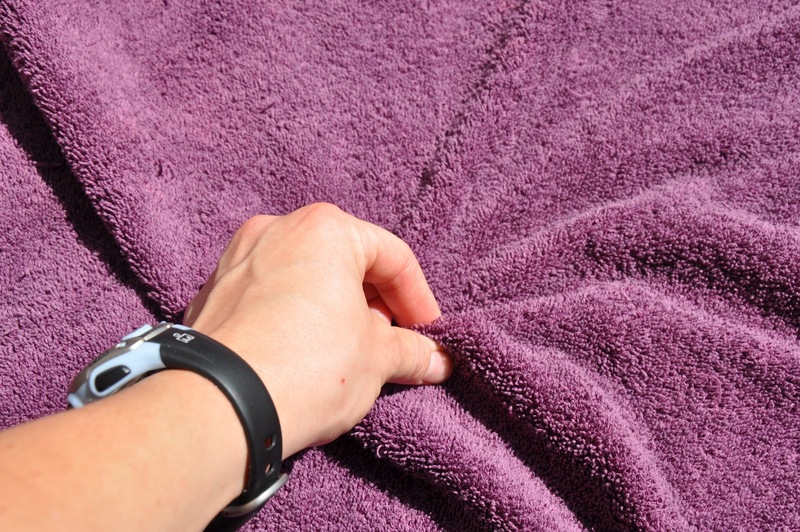 To create the spiral design, lay towel flat and pinch in the middle. 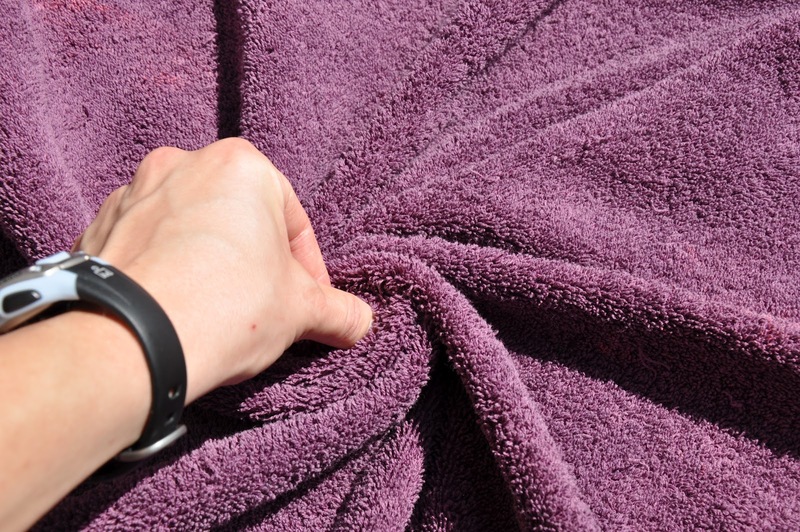 To create the spiral design, lay towel flat, pinch in the middle, and twist until you have a spiral. 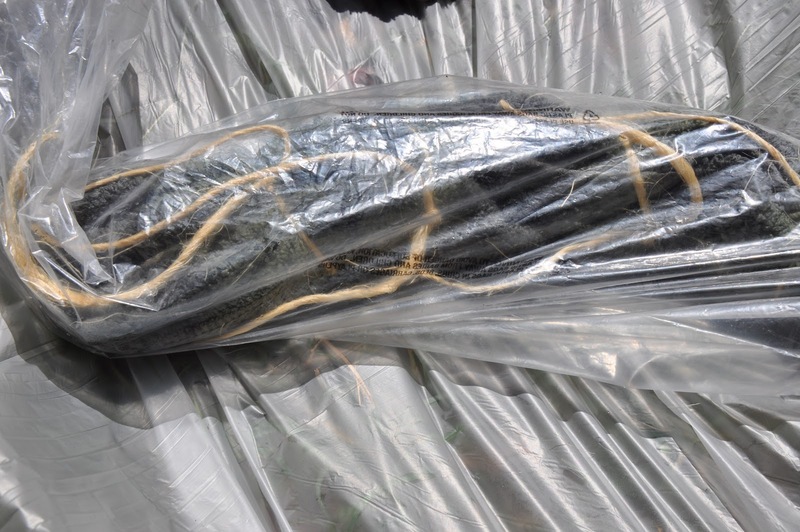 Tie with twine in at least two locations. 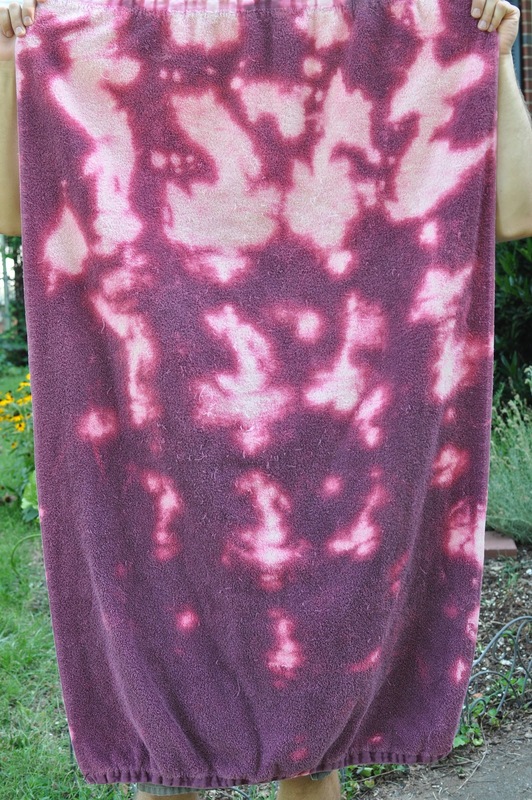 I did not soak this towel before bleaching, so the design did not come out as strong as it could have. A few minutes later and the bleach is working its magic. 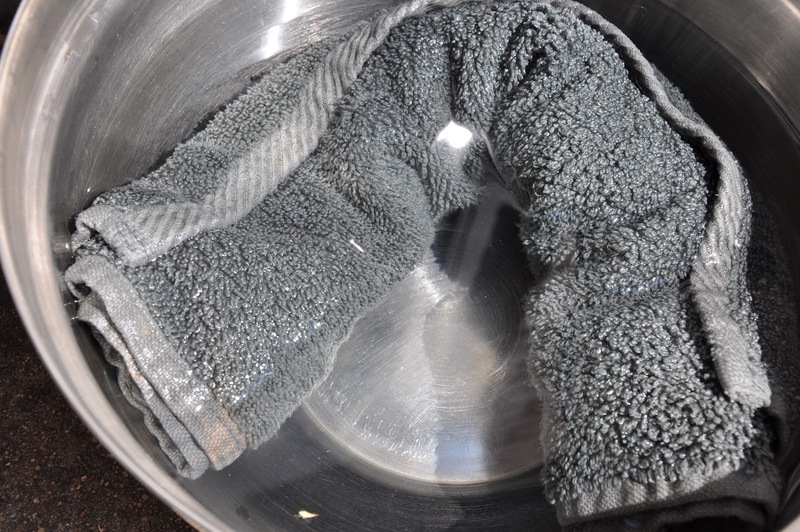 Another spiral design, hold towel in middle, like shown on left. Tie in various locations, as shown on right. 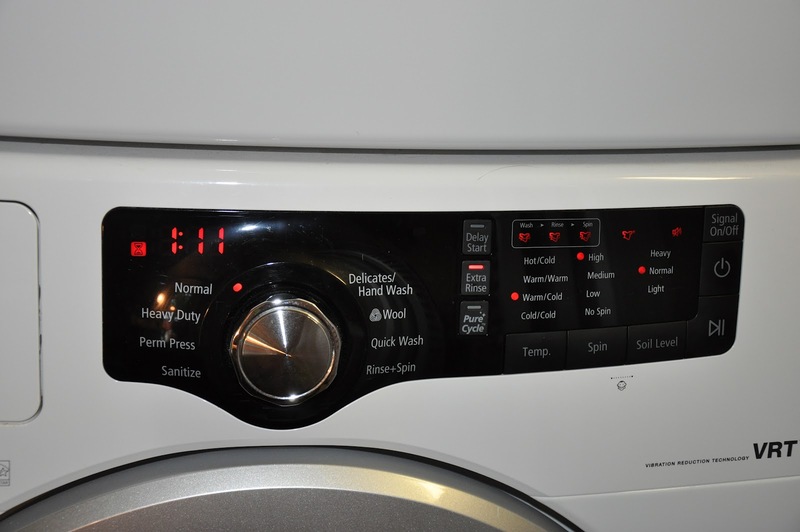 Once you have bleached your towels, and they have rested for ten minutes or more, it’s time to wash them. 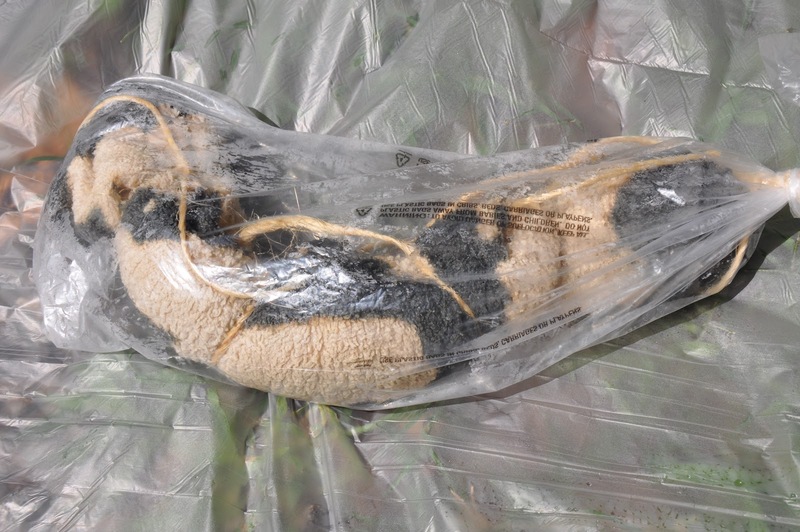 Wearing gloves, unwrap towels and throw away bags and twine. I strongly recommend you do this directly in front of the washing machine. I washed mine on warm with an extra rinse cycle. 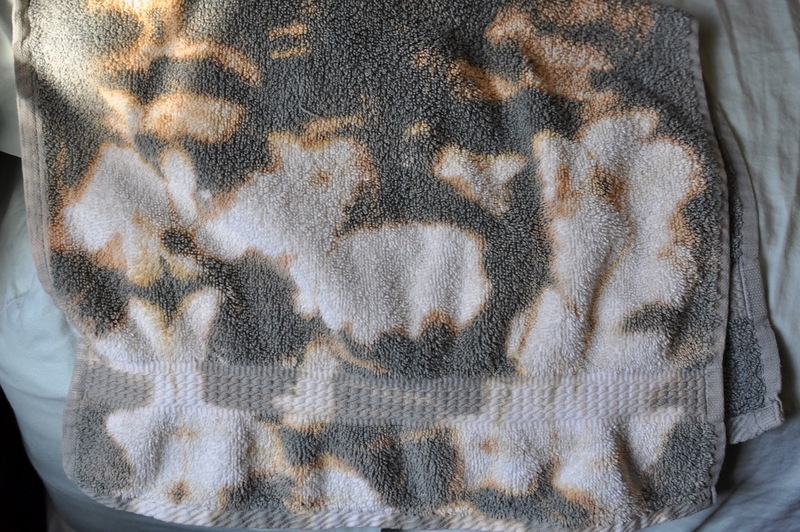 The first towel turned out looking like camouflage. 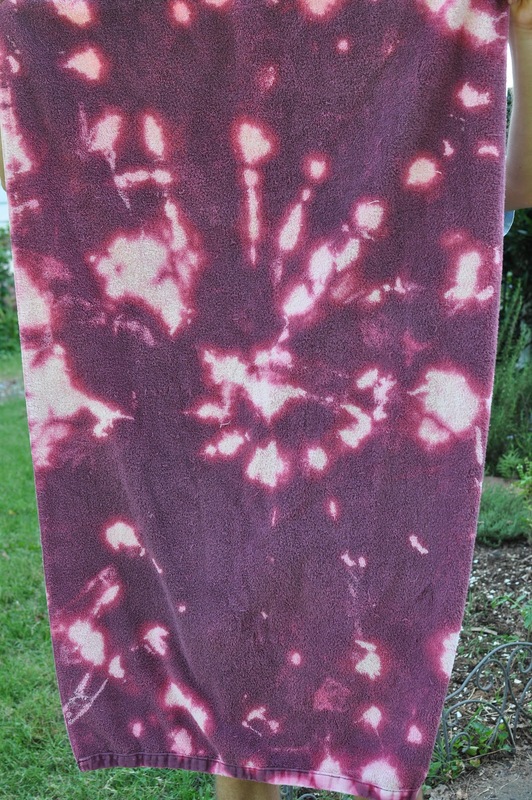 My old bath towels are now re purposed and ready for the pool or beach! The spiral design turned out well, but would have been a stronger design had I wet the towel first. 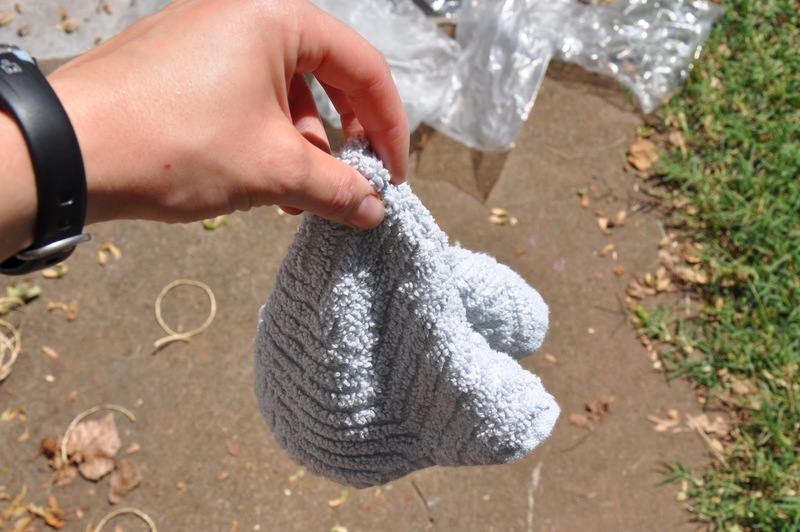 The small washcloth you will see in the next post. Happy dying! If you try this project, let me know how it works out for you.